A Korean man bonds with a local girl over the architecture of Columbus, Indiana. Situated in the heart of what coastal Americans disparagingly refer to as 'flyover country', the MidWest town of Columbus, Indiana is a mecca for fans of modernist architecture, boasting structures designed by such leaders of the field as Eliel and Eero Saarinen, Robert Venturi and I.M. Pei. It's the ideal setting for the directorial debut of Kogonada, a video essayist whose YouTube essays break down the architecture and design of the greats of cinema. A tribute to a town he fell in love with on a family trip, Columbus sees Kogonada compose a minor city symphony, one with notes as sparse as Eno's Music for Airports. Our entry point to the Indiana town is Jin (John Cho), a forty-something Korean-American who returns to the US from Asia when his father, a professor of architecture, falls into a coma. Our tour guide is Casey (Haley Lu Richardson), a local teen whose love of her town's architecture and sense of duty to her recovering meth addict mother (Michelle Forbes) is preventing her from leaving for college. The two run into each other when, stressed out by his circumstances, Jin bums a cigarette off Casey (Columbus might feature more onscreen smoking than any other American film of the last decade). Realising Jin is the son of the professor whose work she so admires, Casey is surprised to find him disinterested in architecture, but the two strike up an instant friendship, spending the next few days bonding over Casey's enthusiasm for her town's structures, which proves a welcome distraction for Jin. With its trans-Pacific, platonic central duo, Columbus might be compared to a mirror image of Lost in Translation, but it's a far more serene and composed film than Sofia Coppola's. With a premise not unlike Before Sunrise, you might expect Columbus to be another dialogue heavy American indie, but in Kogonada's film the images say more than the words. In one scene, Jin asks Casey to tell him why her favourite building moves her, and as Casey replies, Kogonada cuts to the other side of a glass window. We can't hear her words but we can see the joy and passion on the young woman's face and in how her body loosens up freely. As in the films of Kogonada's primary influences - Antonioni, Ozu, Koreeda - the words aren't important; it's the feelings that matter. This sense of the unimportance of words continues when Jin and Casey have a verbal row that ends in the former walking off. 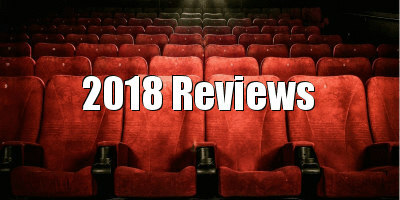 The next time we see them it's as though the argument never happened, because that's how humans behave, but it's something of a shock to see such a simple human truth portrayed so effortlessly in the medium of American cinema, where everyday spits and spats are so often overblown for cheap drama. There's a reason Kogonada's film is named after its setting, as the town is as much a central character as Jin and Casey, who find themselves regularly dwarved by the structures around them. Kogonada shoots whole scenes with his human protagonists reduced to small figures confined within boxes, like an awkward seduction attempt between Jin and his father's assistant (Parker Posey), which the director has play out in a small mirror in the corner of the frame. This creates the sense that such human dramas are fleeting, and will be long forgotten in years to come while the city's structures remain standing. In cinema, modernist architecture has often been used to suggest oppression and failed utopias - think of the use of California's Century City in Conquest of the Planet of the Apes or London's Thamesmead Estate in A Clockwork Orange - but with Columbus, Kogonada reclaims the original idealistic intent of its architects. While visually overwhelming Kogonada's protagonists, the architecture of Columbus ultimately proves a positive influence, its studied, logical lines providing a path to redemption. 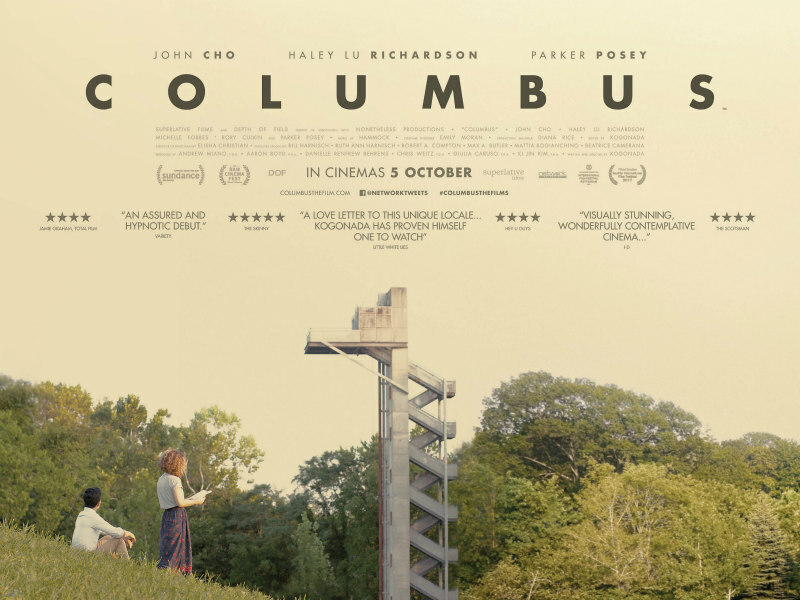 Columbus is in UK/ROI cinemas October 5th.